When two or more batches of molten glass of different colors are mixed, the resulting color, often described as “rainbow,” is produced. (An apt analogy is the mix a cook uses to make a marble cake.) This color is the rarest of the solid colors produced during the late nineteenth century. The collector should be aware that rainbow can also be found in pressed glass of the period. When well-done it can, at first glance, be mistaken for cut glass. Considerable research remains to be done concerning the production of rainbow cut glass during the American Brilliant Period. 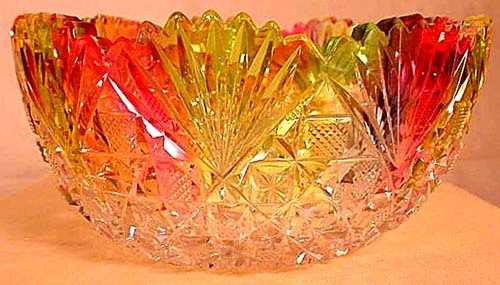 Two views of a finger bowl, one of a pair, in a rainbow color are given here. It is cut in a pattern that is similar to the Oriental pattern by Dorflinger except that that pattern uses strawberry (fine) diamonds throughout; there are no single stars (ACGA composite catalog, DORFLINGER, 1997, p. 66). 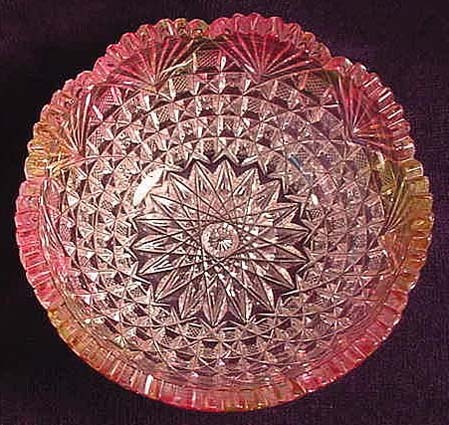 The pattern on the finger bowls is also closely related to Regent II by Straus where both strawberry (fine) diamonds and single stars alternate positions on all of the diagonals; this is not true of the finger bowls’ pattern. Regent II is the second of two different Regent patterns that were introduced by Straus during 1888-89 according to the ACGA STRAUS – MACY catalog (2000) which gives both patterns the same name, Regent. Both patterns should be double-checked to identify a possible error. For example, an incorrect illustration could have been printed in the original publication, The Crockery and Glass Journal. The issues of 26 Jul 1888 and 19 Sep 1889 were used by the compilers of the ACGA catalog. Red and yellow are the two colors used in the making of this finger bowl, one of a pair, c1890. D = 5.25″ (13.3 cm), H = 2.6″ (6.6 cm). Sold at an eBay auction for $2,425 (for the pair) in 2002.